How Can I Publish to Buffer and Hootsuite from Rival IQ? Many of our Rival IQ customers use Buffer or Hootsuite to publish content to various social networks, so we wanted to make things easier for you republish great content that you find in Rival IQ using those tools. Enabling the Buffer or Hootsuite integration is easy. Simply go to Settings > Connected Services in Rival IQ and select the publishing tool you'd like to use. Once you enable Hootsuite or Buffer in your Rival IQ account, you'll see a Hootsuite or Buffer icon in most places where content is displayed from social networks. Click that icon to start the publishing process for Hootsuite or Buffer. 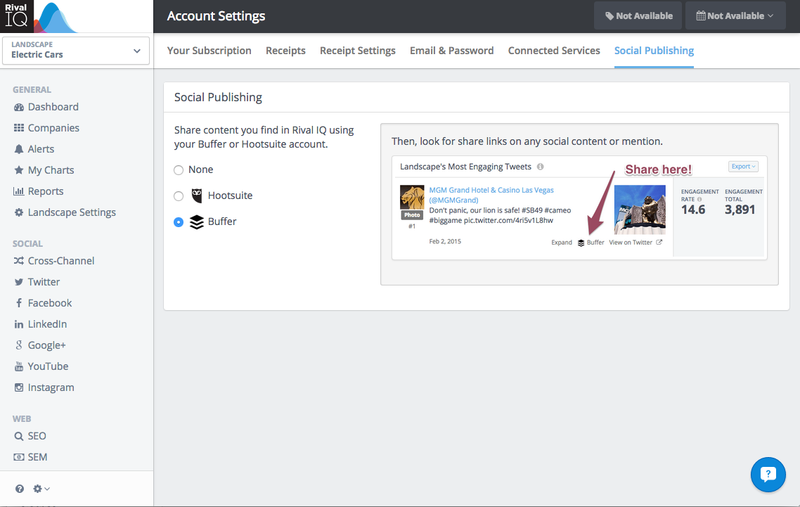 Rival IQ will publish the content you suggest using your Hootsuite or Buffer account.